Piazza Seafood Presents: Mimi’s in the Marigny, New Orleans, La. Your traditional neighborhood corner bar is anything but. Adorned with his own paintings, Chef Heathcliffe Hailey has brought a unique dining experience to the Marigny. His take on dishes using on hand ingredients is a unique approach that showcases a staple of simple fixings and fresh proteins. With just a few items listed on the menu and no descriptions (yes, you read that right), Hailey can address each diner’s palate individually. “Menu’s restrict your freedom,” remarks Hailey. Chef Hailey shops for food daily, getting locally grown produce to pair with fresh seafood from Piazza Seafood. “Oh and I throw quality in there too,” which makes the phonetical C sound Hailey jokingly describes. There is a ton of mystery and excitement when ordering off Mimi’s menu without descriptions. Chef Hailey’s “Trust Me” menu option is a culinary experience unlike any other. Hailey introduced this “Trust Me” concept in 2002 and he has taken it to each kitchen he has been in. With a 200 sq. ft. kitchen at Mimi’s, there is not a lot of food storage. This space issue ensures fresh ingredients are selected daily and Hailey can customize an offering for that day based on that selection. Therefore, each dish is unique ensuring no diner has the same thing twice. Each “Trust Me” dish is prepared as a single, one-time only, chef choice. Gone are the days that you can look at the couple’s plate next to you and say, what is that? I want to order that. “I am making something for you,” explains Hailey. Scary? Maybe. But trust me, you won’t be disappointed. When I sat down with Hailey, I was able to see his vision come to life. He ordered the pescatarian “Trust Me” so I could see how Piazza Seafood would be used in this one of a kind culinary experience. What graced the small, bar high-top that was lit with a small tea candle in an intricately patterned gold votive was a Thai grilled salmon. 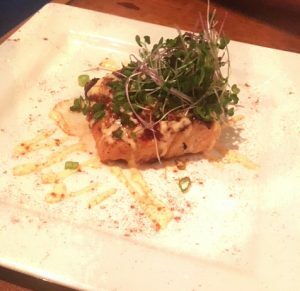 Drizzled with a chili aioli and topped with spicy radish micro greens, it was visually stunning. But how did it taste? The salmon melted in my mouth like butter and the chili aioli added a subtle heat that paired wonderfully with the crunch and hint of spice from the greens. You could taste how fresh the salmon was. With Piazza Seafood, you can trust that you will get the three C’s along with a bonus fourth according to Hailey. “Food is fleeting, it can only live in the long term memory,” explains Hailey. 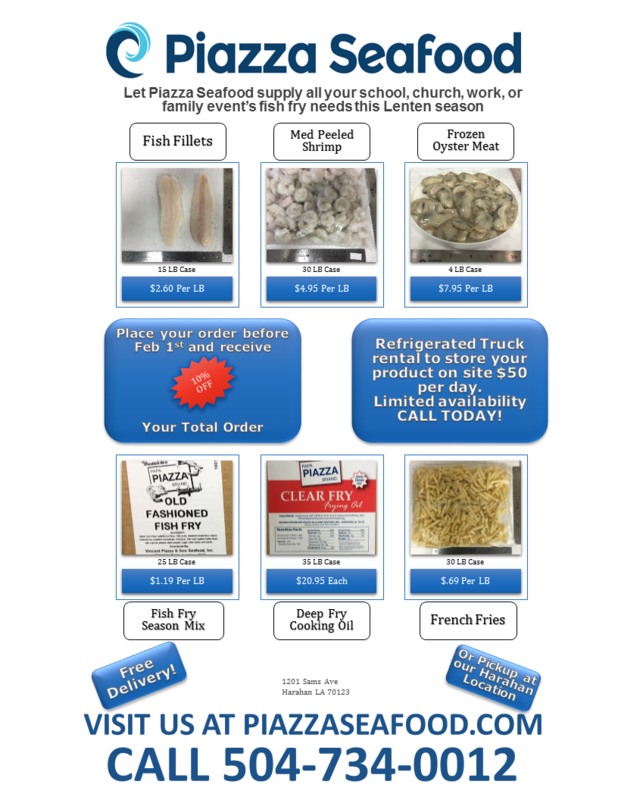 Visit us at PiazzaSeafood.com to find out more. Big thanks to Chef Heathcliffe Hailey for sharing his dish and thoughts with us.